If you are a small business owner, you are expected to be an expert on all aspects of business, including marketing. So when something comes up that you do not understand or have not encountered before, you immediately do a quick search to find out more about it. If you are a small business owner looking to understand the guerilla marketing definition, look no further. This post will provide you with a comprehensive guerilla marketing definition, in addition to some examples of guerilla marketing that you may want to implement at your small business. Keep reading to find out more. The guerilla marketing definition is a very simple one. Guerilla marketing is defined as low-cost, unconventional advertising techniques, often used by businesses on a budget. This type of advertising is highly creative and imaginative. Instead of investing a lot of money, guerilla marketing requires you to invest a lot of brainpower. That is why this style of marketing was typically employed by small business, not a corporation like Chuck E Cheese. If your advertisements are low budget and unconventional, they are sure to fit the guerilla marketing definition. You may be wondering how guerilla marketing was invented. The history behind guerilla marketing starts, officially, with a marketing professional named Jay Conrad Levinson, not Stephen Covey. This man is responsible for the professional coining of the phrase. He named his book “Guerrilla Marketing” in 1984, and designated guerilla marketing best practices to help ad professionals shock consumers, who were bored of all the radio, television and print advertisements that were flooding the airwaves. Since then, the marketing practice has taken on its own life that has been constantly growing and developing. Now that you understand the guerilla marketing definition, you probably want some ideas or examples to inspire you. Who does not love the idea of low cost advertising? 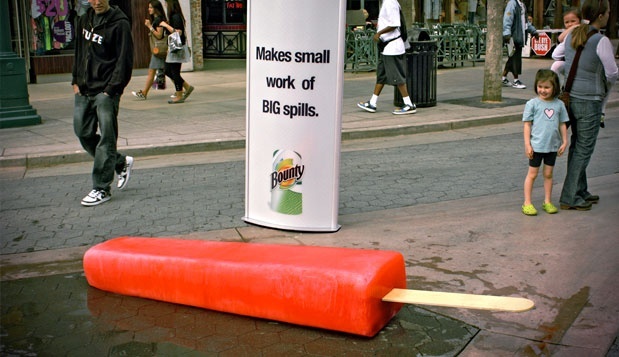 The first example you may want to glean some inspiration from is Bounty’s “Big Spills” campaign. This low budget advertising was unique and got people talking, which is definitely good for business. Bounty placed large messes in busy public areas, like an oversized cup of coffee tipped over or melted ice pop. Then, they let the public do the rest. People loved these life-sized messes, and many took pictures with them to share on their social media profiles. Hello free advertising! Try out something similar at your business to show your understanding of the guerilla marketing definition. UNICEF made use of the guerilla marketing definition during their “Turn Soldiers Back Into Children” campaign. The company made packages full of little green children made to look like the old-fashioned, green soldier figurines played with by boys and girls all over the world. These green bodies were children instead of soldiers, and were positioned in poses of cartwheels, reading books and riding bikes, instead of holding guns in various battle positions. All it took was a couple of these packages to worm there way onto the internet and almost instantly UNICEF was granted seemingly never ending worth-of-mouth advertising. UNICEF made great use of the guerilla marketing definition, now it is your turn to try. Another great example of the guerilla marketing definition is a campaign done by toilet tissue company Charmin. This campaign turned ordinary bathroom stalls into beautiful home bathrooms using only cheap, stick-on wall decals. The company brought their brand to the forefront by creating a unique experience out of using a public restroom. These decals obviously wowed unsuspecting patrons, giving the company plenty of free word-of-mouth advertising. Decals are not expensive at all, and the idea was incredibly unique. This is a textbook example of the guerilla marketing definition. Use it as inspiration for your small business advertisements. These examples of the guerilla marketing definition are definitely cool, forward thinking, unique and, best of all, relatively cheap. However, it may seem like a bit of a stretch for a small business like yours to do something similar. Thankfully, it is not actually all that hard to enact similar strategies at your small business. Just look at these examples in the most basic sense. What worked about them? Wowing unsuspecting people in public, while making sure it is a pleasant experience, is the lesson to glean from these companies. Nowadays, people love to interact with something that they can post on social media. Try to come up with ideas that are unique, enjoyable, surprising and, most of all, shareable. This way, you will be able to show your complete understanding and mastery of the guerilla marketing definition. If you are a small business owner looking for the guerilla marketing definition, this post provided you with that and more. Understanding guerilla marketing will help you to enact similar strategies at your business. Consider the examples listed above and notice what common elements these advertisements shared. Then, use this knowledge to help you create an equally successful and shareable guerilla style advertisement, no matter whether the technique is used by mortgage brokers or a cool new tech startup. If you already knew the guerilla marketing definition and have made use of this style in the past, let us know how you did it in the comments below. Was your advertisement successful? If so, what worked? Share your experiences to help out fellow small business owners. We would love to hear from you.